This section traces the fascinating history of swords, sabers, spears and lances through to the 20th century. Since the first flint spearheads emerged at the dawn of humanity around 600,000 years ago, edged weapons have played an incredible role in the shaping of human history. Used by people as diverse as the ancient Egyptians, medieval knights and American civil war soldiers, these weapons have become some of history's most powerful status symbols. ABOVE: French dragoon officer’s sword, Model 1854. From the primitive edged weapons used by early humans through to those of the modern world, the history of the sword is a truly fascinating story. It has been used as a fighting weapon, a symbol of authority, a mark of social rank and as a ceremonial object. For centuries, the sword remained the first weapon of choice for the military soldier and its pre-eminence was secured by a combination of continuous technological improvements and adaptation to ever-changing battlefield conditions. The historical background to the development of the sword and other edged weapons starts with an examination of the simple tools of Stone Age people, including hand-held flint points and the first axes, which date from 1.4 million years BC. We then move ahead in time to focus on such ancient civilizations as Sumeria and Mesopotamia, where metalworkers began to combine bronze and copper alloys to produce reliable spears, axeheads and swords. In ancient Egypt, the countless invasions and subsequent assimilations led to the introduction of bronze- and iron-bladed weapons. Although noted for their reliance on the spear and shield, the Greek infantryman or “hoplite” also carried a straight, double-edged, leaf-shaped short sword known as the “xiphos” and it became the model for the more recognizable Roman “gladius”. At this time, Celtic swordsmiths were also producing swords of unique beauty and robustness. In Europe, the wide-bladed and double-edged Saxon and Viking broadsword would become the inspiration for the early medieval “knightly” sword of the 11th to the 14th century. In both Europe and Asia, polearms (pole-mounted weapons) were used on the battlefield, and in the jousts of the medieval and Renaissance periods, public displays of horsemanship and fighting skills were performed using the lance and the sword. Sword design changed during the Renaissance and, from around 1400, the emphasis shifted from a sword that had cutting and slashing capabilities to one that could pierce plate armour. Around 1500, the rapier appeared and soon became the sword of choice for a gentleman and the ultimate weapon for trials of honour, such as the duel. German and Swiss mercenaries (“Landsknechte”) roamed across Europe, carrying their own huge, two-handed swords and waded into massed rows of enemy infantry, cutting and hacking a passage through for the cavalry. During the 16th and 17th centuries, more accurate firearms and artillery were developed, and swords were relegated to a secondary role, although they were still regarded as the preferred weapon during close combat with the enemy. ABOVE: The two-handed Landsknecht sword was often used by Swiss and German mercenaries during the 15th and 16th centuries and was very effective when attacking infantry units. The introduction of the smallsword in the late 17th century highlighted the new requirement for both practicality and fashion. On the battlefield, the seasoned soldier knew that a more robust broadsword would always be required, such as the distinctive broadsword of the Scottish Highlander. Wide-bladed and double-edged, this broadsword had an enclosed basket hilt and was devastating when used at close quarters. 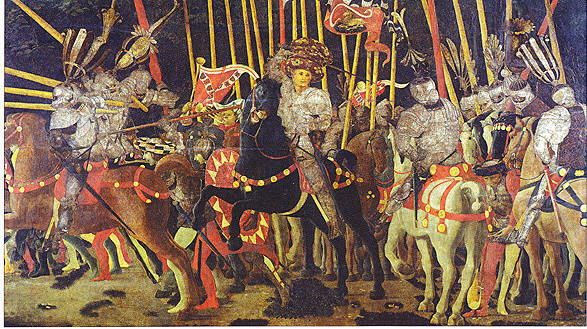 ABOVE: The Battle of San Romano in 1432. The medieval battlefield normally comprised a mass of polearms and poleaxes which were used to inflict injuries both from horseback and on foot. During the late 18th and early 19th centuries Europe and the outside world were rocked by countless wars and momentous battles. The swords carried by the major nations at war, particularly the French and British, are studied, as are the swords that were carried during one of the bloodiest conflicts outside Europe, the American Civil War. However, by 1914, the sword had become obsolete in battle and, after the First World War, it was relegated to a purely ceremonial role. Indeed, during the rise of Nazi Germany, we see the sword worn simply as a dress accessory. 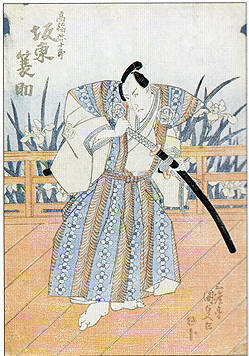 In Japan, the rise of the Samurai warrior class during the 12th century saw the development of the Samurai sword. These swords had a complex and ritualized process of manufacturing. China also has a long history of sword making that stretches back over 3,000 years and includes such indigenous swords as the famous straight-bladed “jian” and the curved-bladed “dao”. In addition, a wide variety of polearms was carried by the Chinese foot-soldier. The Indian sword was almost totally unaffected by the influences of the West. Even when the British Empire had established virtually complete control over this vast country, Indian swordsmiths continued to produce unique indigenous swords of superb artistry and quality, including the “taiwar” and the “khanda”. In Africa, there was a dramatic division in sword styles between the Muslim-influenced north of the continent, and the central and southern areas. ABOVE: A 19th-century Japanese print depicting a Samurai warrior with his sword. Their swords were often given names as a mark of devotion and a belief that their warrior spirit was contained within them. There is a comprehensive list of swords, spears, axes, lances and polearms in the directory of swords and sabers. The development of the sword from ancient to modern times includes an enormous variety of styles found within specific time periods and geographical regions. Each weapon is described in detail and listed according to country of origin, chronology and type. Sword dimensions are included to give an accurate idea of scale. Each entry also has a short description detailing both the function and historical context of the weapon. The directory follows the progression of the sword from the Stone Age to the modern-day. ABOVE: This British Army officer’s sword, c.1870, was not used in fighting but carried as a dress sword and only worn on dress occasions, It was a regimental sword of the Border Regiment, based in the north of England.